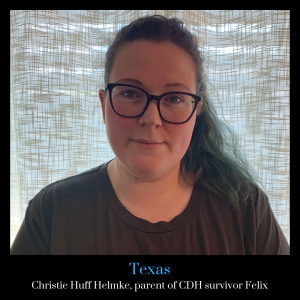 We want to introduce you to CDH International’s Texas Ambassador, Christie Huff Helmke. Christie is the mom to cherub Felix. Christie was born and raised Canadian and her husband is Texan. Their son Felix is two years old and he is their world. Felix was diagnosed 20 weeks in the womb with CDH and that is where their journey began. They live in DFW, Texas, with their four dogs. Christie is a pet stylist and her husband is a camera man. When they first found out their son had CDH, it’s like the walls where closing in all around them, it was terrifying. They remember not knowing where to turn to or who to talk to, they wanted answers, success cases, they never knew CDH even existed and now it will forever be a part of them. Felix is their whole world and what brings him joy makes them happy. They love spending time with him, exploring new parks and doing fun activities with him. Christie enjoys arts and crafts, being around animals, baking and a great glass of wine.